Suomi is the native word for Finland, and the first of the series bearing the name was developed from 1922 onwards which makes it one of the earliest sub-machine guns to appear. It was designed by the well-known Finnish designer Johannes Lahti, and the first finished models appeared in 1926. They were effective but very complex weapons, designed to fire the 7 62mm Parabellum cartridge from a magazine with such a pronounced curve that three of them placed end to end formed a complete circle. This gun was only produced in very small numbers and is thus chiefly of interest because it was the first of a series. The model illustrated was also designed by Lahti, but although it retained some of the features of the Model 26, so many changes were made that it was virtually a new weapon. Although patents were not finally granted until 1932 the gun was in use by the Finnish Army in the previous year, hence its final designation of Model 31 It worked by normal blowback system and had no less than four different magazines, a single 20-round box, a double 50-round box. and two drums, one of 40-round capacity and one of 71. Like most sub-machine guns of its vintage it was very well made of good steel, heavily machined and milled and unusually well finished. The end product was therefore an exceptionally reliable and robust weapon and although it was very heavy by modern standards (with the bigger drum magazine it weighed over fifteen pounds) this at least had the merit of reducing recoil and vibration and thus increasing its accuracy, for which it was very well known. It was made under licence in Sweden. Denmark, and Switzerland, and apart from Finland was also used by Sweden, Switzerland and Norway and to a lesser extent Poland. It is still used in many units of the Finnish Army, although all surviving weapons have been modified to take a modern 36-round box magazine of improved pattern. At the end of 1939 the Russians, having failed to persuade the Finns to make some territorial adjustments to enhance Soviet security, invaded Finland. The Finns fought bravely and made good use of the Suomi. A Finnish soldier fires his Suomi Model 1931 SMG; in this case fed from a drum magazine. correspondingly. One of the interesting features of this gun is that it incorporates a grip safety, this consists of an L-shaped lever just behind the magazine housing (which also acts as a forward hand grip). Firm pressure on the vertical part of the lever (which is clearly visible in the photograph) causes the horizontal arm to be depressed sufficiently to withdraw an upper stud from the bolt way. thus allowing the working parts to function. 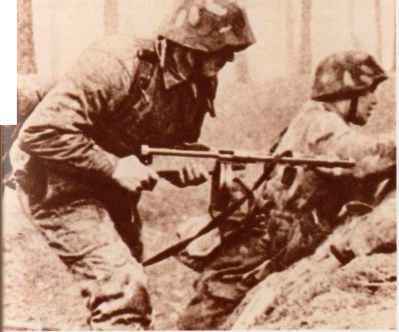 This device which was similar to the one employed on some models of the Danish Madsen submachine gun, was a useful one. but it did of course prevent the weapon being used single-handed. 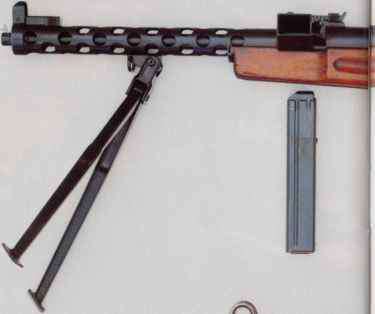 The TZ 45 had a retractable stock, made of light tubing: when pushed in the front ends engaged in holes in a plate below the barrel about six inches (153mm) from the muzzle Although probably not specifically intended for the purpose it presumably also acted as a stop to prevent the weapon being pulled back from a port in an armoured vehicle by some sudden jolt, rather like the attachment on the German Schmeisser. There are two parallel slots cut into the top of the barrel at the muzzle end which act as a crude but moderately effective compensator. Although it was an adequate weapon the TZ 45 came too late in the war to be of much use and only about six thousand were made. These were chiefly used by Italian troops on internal security duties including the rounding up of the armed deserters of half-a-dozen nationalities who had happily taken to banditry in the last months of the war. After the war the gun was offered commercially on the world market, but only the Burmese showed interest, a number being locally made there in the early 1950s These guns were manufactured under the title BA 52.